At Ely House in London, John of Gaunt tells his brother, the Duke of York, that he is worried about England. He hopes Richard arrives, for he has much to say, and dying men tend to be listened to. York doubts Richard's ability to listen: his ear "is stopp'd with other flattering sounds" (II.i.17). York gripes about England following Italian fashion (II.i.21f). "The reference to Italy is anachronistic and is more nearly an expression of Shakespeare's own nationalism rather than of York's in 1399" (Asimov 279). De Vere was mocked for his adoption of Italian styles (Farina 113). Shakespeare has John of Gaunt deliver a patriotic speech dubbed "the most stirring paean to England ever written" (Herschel Baker, Riverside 843). The central portion has become very famous, a syllabus motto for teachers of English literature and a noble finale delivered by Basil Rathbone at the end of the 1942 movie Sherlock Holmes and the Secret Weapon in which Holmes foils Moriarty and the Nazis during WWII. But that damned Richard is ruining everything, and "as a full citation of the speech will make plain, the joyous note with which the speech appears to begin soon reveals itelf as part of an elegiac lament. The country "Is now leas'd out -- I die pronouncing it -- / Like to a tenement or pelting farm" (II.i.59-60). Gaunt's "evocation of what England should be serves as a measure of Richard's disqualifications for the kingly office" (Wells 138). Also, "The description is of an England blessedly isolated and on the defensive, but in Gaunt's time, the English philosophy of war was entirely offensive" (Asimov 281). John of Gaunt's speech is addressed, significantly, not to his nephew King Richard, who arrives too late with his groupies to hear it, but instead to Gaunt's brother York, the last survivor of the older, ordered world" (Garber 246). Oxford may be thinking of the his mentor, the Earl of Sussex, as Gaunt (Clark 501f; Ogburn and Ogburn 563); Sussex died from a wasting disease (or Leicester's poison) in 1583, and hence the puns (II.i.73-83) since toward the end he was indeed "gaunt" (Ogburn and Ogburn 432). "Can sick men play so nicely with their names?" asks Richard (II.i.84). "No, misery makes sport to mock itself: / Since thou dost seek to kill my name in me, / I mock my name, great King, to flatter thee" (II.i.85-87). Gaunt rails that Richard is sick, surrounded by political leeches, and functioning not as a king but as a landlord of England (II.i.113). He mentions Richard's involvement in Gloucester's death too. Interestingly, this roundabout way of shaming Richard nearly applies as well to Henry as an eventual family-destroying grandson of Edward III. Gaunt hopes his words remain in Richard's mind to torment him. Richard is peeved and Gaunt is led off where moments later he'll have died. York tells Richard he said all this out of love. But at the report of Gaunt's death, Richard says, "His time is spent, our pilgrimage must be" (II.i.154), and lays claim to his estate in order to fund a war with Ireland. York thinks this move is bound to have disastrous consequences. He thinks fondly and proudly back on his brother the Black Prince, Richard's father (II.i.171ff). When Richard exits with his queen Isabella and the others, Northumberland, Willoughby, and Ross tentatively begin a conversation. Ross insists, "My heart is great, but it must break with silence, / Ere 't be disburdened with a liberal tongue" (II.i.228). They soon are bewailing the state of the kingdom and siding with the banished Henry. Henry, along with many other prominent nobles, are heading by sea to the north coast of England, planning to land when Richard is in Ireland. Northumberland, Ross, and Willoughby are anxious to hop on their horses and join him. With Richard headed off to Ireland now, Queen Isabella discusses her depression and anxiety with Bushy, even though historically she should be only ten years old (Asimov 287). We get reference to "perspectives, which rightly gaz'd upon / Show nothing but confusion; ey'd awry / Distinguish form" (II.ii.18-20); these are renaissance images that reveal something hidden when looked at from a different angle (Garber 267). Holbein's The Ambassadors is the best-known example. There's also some quibbling on the notion of "nothing" (II.ii.31f). Green enters, fretting about Richard's absence and reporting that Henry has landed in the northern regions. Northumberland, his son Harry Percy, and other lords have joined forces with him. The Queen now commits to despair, calling the idea of "cozening" hope "a flatterer, / A parasite, a keeper-back of death, / Who gently would dissolve the bands of life, / Which false hope lingers in extremity" (II.ii.69-72). 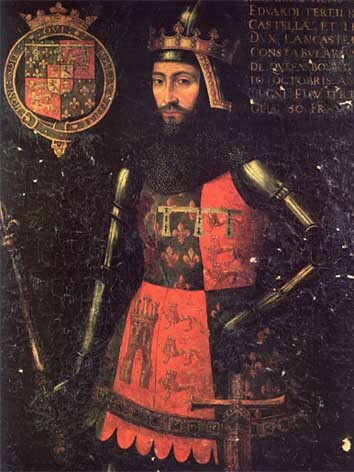 York, left in charge while Richard campaigns in Ireland, sends for his sister-in-law the Duchess of Gloucester to supply him "a thousand pound" (II.ii.91). But a servant reports that she has died. York counts among his woes this death of Gloucester's widow, the popularity of Henry, and the lack of money to fight rebels anyway. Bushy, Bagot, and Green start abandoning ship. Bagot describes the problem with "the wavering commons, for their love / Lies in their purses, and whoso empties them / By so much fills their hearts with deadly hate" (II.ii.129-131). Bushy figures that "for little office / Will the hateful commons perform for us, / Except like curs to tear us all to pieces" (II.ii.137-139). None is sure if they will meet again. It shall be still thy true love's recompense. Historically, "Bolingbroke made his move at the beginning of July 1399" (Asimov 286). York arrives and warns Henry about his trespassing, invoking a supposed past event "when brave Gaunt, thy father, and myself / Rescued the Black Prince ... / From forth the ranks of many thousand French" (II.iii.100-102). There is no record of Gaunt and York ever rescuing their brother in the manner described in this scene (Asimov 291). York considers his nephew Henry as invading "in condition of the worst degree, / In gross rebellion and detested treason" (II.iii.108-109). But Henry pleads his case adamantly: "As I was banish'd, I was banish'd Herford, / But as I come, I come for Lancaster" (II.iii.113-114). So a new name (or title) = a new identity? Henry appeals to York: "You are my father, for methinks in you / I see old Gaunt alive" (II.iii.117-118). The insistence is that he has come solely concerning the misappropriation of his own inheritance. And yet my letters-patent give me leave. And these, and all, are all amiss employed. It sounds like a complaint Oxford could have and would have made about his own subjection to wardship. So York is somewhat sympathetic about the Lancastrian inheritance, and Northumberland assures York that their support of Henry applies only to intended claim on his inheritance. Henry refers also to the issue of Bushy, Bagot, and that lot. York ultimately is just too old and worn out to do much about the chaos of abuses there. Henry has "sworn to weed and pluck away" (II.iii.167) these "caterpillars of the commonwealth" (II.iii.166) -- a phrase that may have come from Gosson's School of Abuse, a new book in 1579/80 (Ogburn and Ogburn 441). The other to enjoy by rage and war. Salisbury is more pragmatic, but as grim in prognostication: "Thy sun sets weeping in the lowly west, / Witnessing storms to come, woe, and unrest" (II.iv.21-22). Shakespeare may be thinking of the solar eclipse and other events of 1582 (Ogburn and Ogburn 441).